"...he's taken to continue his good run of form by following up." 16:30 - PIKE CORNER CROSS (10) confirmed his return to form when recording his first win for two years over C&D last month, scoring under a hands and heels ride. Raised 5 lb for that win, he remains with plenty of handicapping scope considering his old form, and he's taken to continue his good run of form by following up. Magic Mirror, who landed this race 12 months ago, also needs considering. 17:00 - JAHBATH (2) confirmed the promise of his debut to win easily over C&D three weeks ago, and he has made a highly encouraging start to his career so far. With more improvement expected, he is taken to defy a penalty and follow up. Ours Puissant also has a penalty to defy but has run to a similar level to the selection, while Spice of Life and Tammooz are newcomers to note. 17:30 - NIVALDO (1) looked potentially useful when making a winning start at Ffos Las in September, overcoming greenness to score going away. He has to carry a penalty here as a consequence, but is open to more improvement yet, and it would be no surprise should be be able to do so considering his pedigree (dam closely related to very smart 11f/1½m winner Nutan). As such, he gets the vote to follow up for the in-form Ralph Beckett team. 18:00 - PURGATORY (1) very much caught the eye when third over C&D on nursery debut a fortnight ago, putting in good late work from a compromising position. It looks like the floodgates are now opening on his ability, and the son of Dark Angel is almost certainly capable of better still and he is the clear pick of these. In The Cove shaped as though the returning to this trip would be in his favour when fourth over 7f here recently and is next best ahead of Kahina. 18:30 - This is a more realistic assignment for EXCHEQUER (3), who has understandably struggled in Class 2 claiming handicaps the last twice. He looked good when striking over C&D in August (first run following wind surgery) and is 2-4 here, with form figures of 12 under Gerald Mosse. Dropped 3 lb for his last run, he is taken to return to winning ways. Espresso Freddo was below par at Chelmsford recently, but will be a threat if bouncing back. Baltic Prince also has claims. 19:00 - LADY DANCEALOT (2) is pretty consistent on the whole, and wasn't beaten far off this mark in a Class 3 Newbury handicap recently, having every chance inside the final furlong before being beaten under three lengths. She was out of luck on her sole previous run on the AW, but there were valid excuses on that occasion, all at sea on her first start racing around bends. As such, she gets the vote to win. Golden Salute is one to keep an eye on in the betting but, as things stand, the selection may have most to fear from Kamra and Related. 19:30 - While her recent form figures don't inspire much confidence, MULTIGIFTED (3) is worth chancing in this open-looking race. 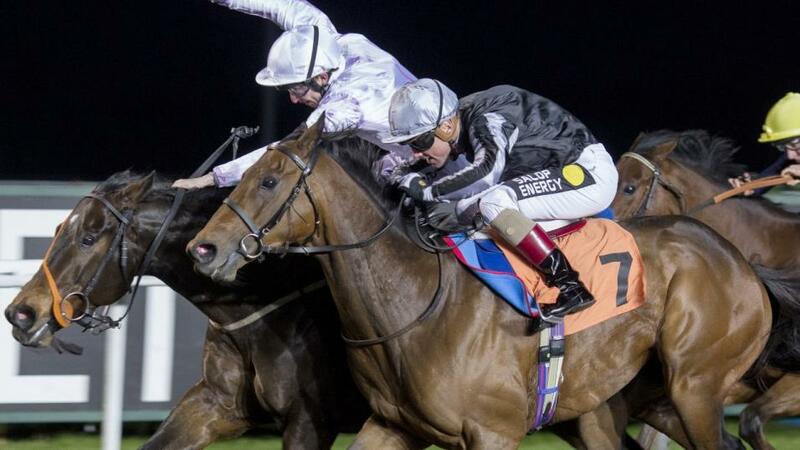 She was runner-up off 2 lb higher at Lingfield in April and there were valid excuses for her no-show here last month, forced wide around the home turn before being badly hampered inside the final furlong. Everlasting Sea should have a part to play if ready to roll, while Galileo's Spear, Pollyissimo, Rahmah and The Last Debutante all command respect. 20:00 - SUNDAY PROSPECT (3) relished the step up to ten furlongs when opening his account at Leicester last time, looking one who's still open to further improvement as her stamina is more drawn out, and this stiffer test could be the catalyst for further progress. Indeed, he still has low mileage and the booking of James King adds to his appeal. A winner of 4 of his 6 starts since switched to handicaps, Landue has to be feared and Take Two will also be a threat if fit enough to do himself justice.